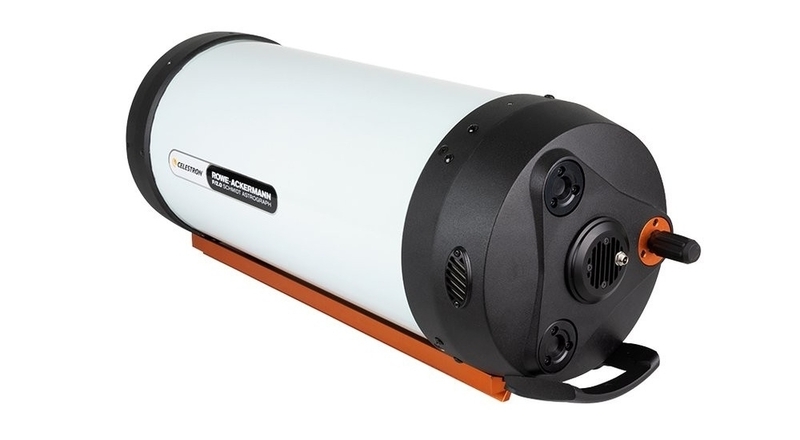 Celestron RASA Rowe-Ackermann Schmidt 8" astrograph with Losmandy bar is the portable 203mm f2 astrograph that allows you to capture spectacular wide-field deep sky astrophotography images with short expositions. This incredibly fast f/2.0 system is the perfect companion to today’s color astronomical CMOS cameras, smaller CCD cameras, and mirrorless cameras. Thanks to its fast focal ratio and patented optical design, you can produce sharp, detailed images and, in many cases, skip the autoguider completely. Weighing in at just 7,7 kg, it’s easy to transport your 8” RASA to the most remote dark sky locations. 3 years of warranty! The 8” RASA is an imaging telescope that delivers a flat field without optical aberrations for razor sharp stars across a wide field of view. 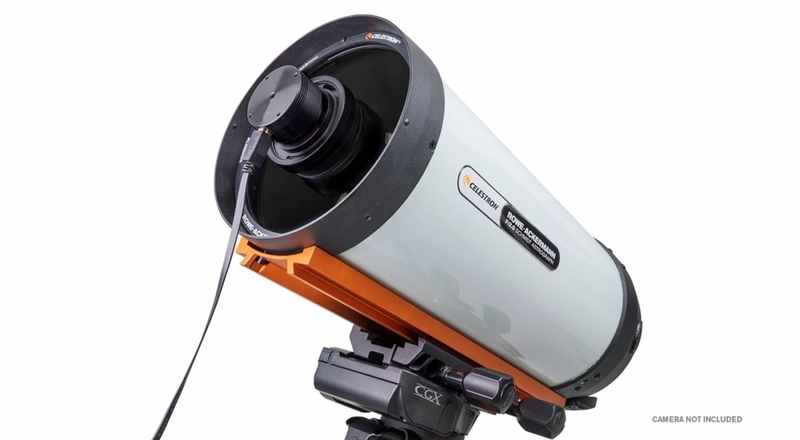 It can capture stunning deep-sky astronomical images without the challenges typically presented by longer focal length instruments at a fraction of the cost of those systems. The latest addition to the RASA family, this 8” version is a much more portable and affordable version of the heralded RASA 11, which was introduced to much acclaim in 2014. With the 8” RASA joining the lineup, a wider range of astroimagers can enjoy the benefits of the RASA design. It has many of the same thoughtfully designed features as its “big brother” RASA 11, including the integrated air-cooling system, internal filter mount, and sturdy CGE dovetail mounting bar. Purely designed for imaging, the 8” RASA cannot be used visually. The prime focus focal plane is located at the front of the optical system, so it cannot accommodate a traditional eyepiece. Since it is an F/2.0 optical system, imagers can use shorter exposure times to capture detail in faint objects. When combined with sensitive cameras and the proper “live stacking” software, the 8” RASA can provide an almost real-time observing experience. View images on a computer instantly that are brighter and more detailed than can be seen in much bigger telescopes with the naked eye. Because shorter exposure times are possible, your equatorial mount won’t need to accurately track over extended periods. The 8” RASA’s relatively short 400mm focal length also lessens equatorial tracking demands. In many cases, autoguiding will not be required. Weighing only 7,7 kg, this optical tube pairs perfectly with a wide variety of mounts. Unlike the larger RASAs that work with DSLR and large CCD cameras, the 8” model was designed with color astronomical CMOS cameras, smaller CCD cameras, and mirrorless cameras in mind. The telescope does not work with standard DSLR cameras. It is optimized for sensors with up to a 22mm diagonal, but performs well with sensors up to 32mm diagonal. The micro 4/3 or APS-C sized sensors used in many mirrorless cameras are a good choice. 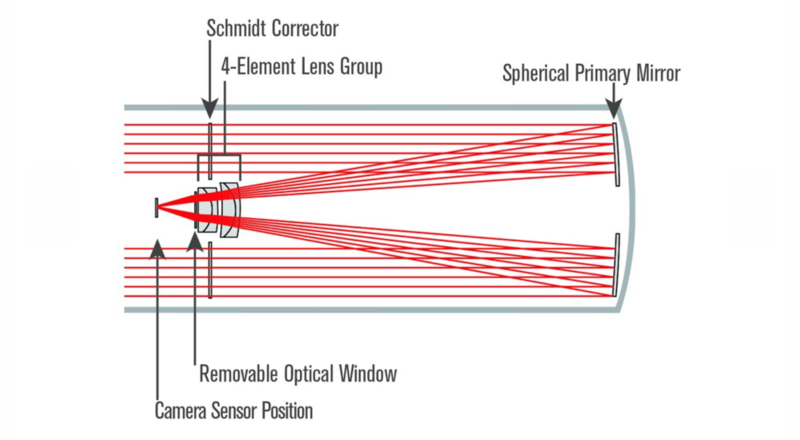 FullFrame sensors will also work, but performance will be poor at the edges of the sensor and field illumination will be reduced. Additionally, we do not recommend pairing RASA 8 with any camera body more than 4” in diameter. See the chart below to determine if your camera is compatible with RASA 8. 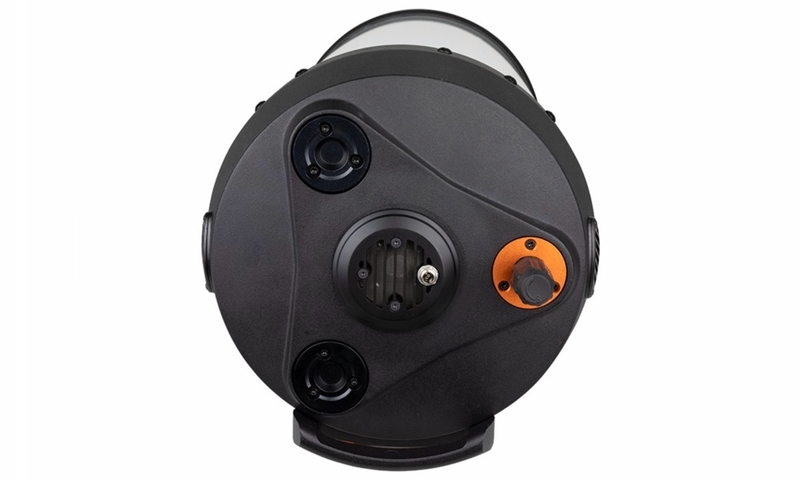 - Ultra-Stable Focus System – six precision sealed ball bearings virtually eliminate image shift. - Integrated air cooling system –12V DC MagLev fan reduces cooldown time and provides optimal air flow while filtering out dust. - Internal filter mount – seamlessly accommodates a Light Pollution Imaging Filter into the optical path.